The United Nations declaration of 2014 as the International Year of Family Farming (IYFF) has done much to publicize the role of small family farmers in global food supply. These are people working in any area of agriculture who derive a significant portion of their income from farming, involve members of the family in managing the farm and rely mostly on family labour. Smallholder family farmers are responsible for as much as four fifths of the food produced in the developing world and are major contributors to global food security. What may be less well known is the key role women play in family farming. Today’s message from IFAD’s Associate Vice-President and Gender Champion underscores their vital contribution. 15 October, marks the International Day of Rural Women, a day that highlights the role of rural women in enhancing agricultural and rural development, improving food security and eradicating rural poverty, and throws a spotlight on the many challenges that they face. 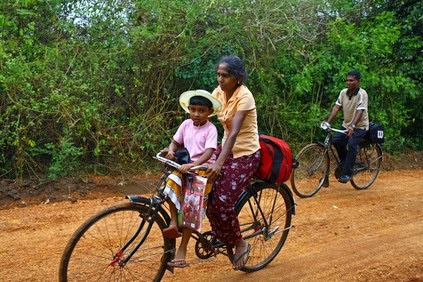 A family traveling along the 2-km werabadiyawa road in Galgamuwa, Sri Lanka. Women provide a substantial part of the work on family farms. They have greater overall workloads than men, combining household responsibilities (cooking, cleaning, collecting fuelwood and water), care of children and the elderly, farming and non-farm activities. Moreover, rural women have limited access to productive resources, customary norms restrict their role in households and public life, which limit their ability to make decisions and seize opportunities. In many parts of the world, rural women have little decision-making power at the household level, including on the use of their own earnings. Investment projects and other programmes are needed to enhance women’s economic and social empowerment, and to support them in ensuring their families’ food security and diversifying income sources. IFAD is developing methodologies for supporting family members in developing their household livelihood strategies. The goal is to work with both women and men to determine common priorities and make joint decisions about what is best for the family and the family business, including the distribution of workloads. Addressing gender inequalities is often part of households’ solutions to these issues. Household methodologies produce critical changes in gender relations within households. 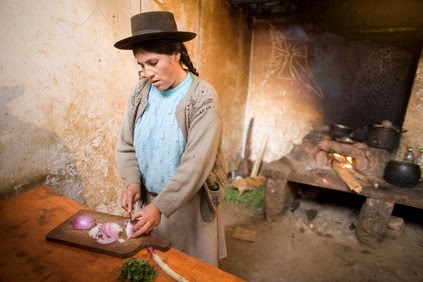 These include the ability of household members to make their own decisions regarding use of available resources to improve their livelihoods, planning together as a family, working towards family goals and holding each other accountable, as well as increased farm productivity along with food security and incomes. As a result, families using household methodologies report that their livelihoods are more sustainable and resilient. Gladys has an improved stove, buys and sells animals with her husband, and cultivates sweet peas. Women’s groups, including cooperatives, producers’ organizations and self-help groups have proven to be another effective way of addressing some of the challenges faced by women farmers. These groups can facilitate access to markets and financial services for women, and self-help groups can build women’s confidence, voice and bargaining power. The groups also provide a safe environment for women to learn new skills, discuss and design their own solutions, implement joint actions, obtain access to productive resources, and process and market products. In addition, the women’s groups provide a platform where social issues and attitudes at the household level can be addressed and changed, including domestic abuse, alcoholism and malnutrition. The Tejaswini programme has also initiated the innovative Shaurya Dals (“Courage Brigades”) to deal with violence against women at the village level. A Shaurya Dal is a small village group consisting of 10 members, with five women from self-help groups, and the remaining five persons from the village (including two male members) who are aware and sensitive to gender issues and have required social acceptance. The objective of these groups is to sensitize the village population regarding issues of violence and sexual harassment against women and girls, and to address and resolve these issues through community-based solutions. In line with IFAD’s Policy on Gender Equality and Women’s Empowerment and the commitment to place family farmers at the forefront of agricultural transformation and sustainable development, IFAD-supported projects and programmes are increasingly addressing women’s role in family farming. Through the use of household methodologies and by involving women farmers in women’s groups, the aim is to strengthen their decision-making power and increase their income earning opportunities for the benefit of the entire family.